A running short designed for lightweight wovens or mesh fabrics with three optional pockets, curved seamlines, bound hem, and elastic waist. An optional runderwear brief or thong can be attached at the waistband or worn separately. Intermediate sewing skills are required for this pattern – some experience with sewing knits is expected. The shorts pattern is drafted with some ease and can be sewn with woven or stretch fabric. The runderwear pattern requires 4-way stretch jersey fabric with good recovery – it is drafted with 10% negative ease (the finished garment will be 90% of body measurements). The shorts inseam is 5cm (2in). 1cm (3/8in) seam allowances are included on the shorts, except for the waistband edge, where a 4cm (1 1/2in) elastic allowance is included. A 6mm (1/4in) seam allowance is included on the runderwear. This pattern is designed and tested to print onto both A4 and US Letter paper, and uses 21 pages for the pattern. If you are only making the shorts, you’ll need to print 15 pages, with the runderwear making up the other 6 pages. A “Print at Copy Shop” version is available upon request. I am a long-distance runner and also a sewist – I’ve long been disappointed by the quality and fit of exercise clothing available on the market, so I’ve been sewing my own for the past few years – even running three full marathons in my own leggings! 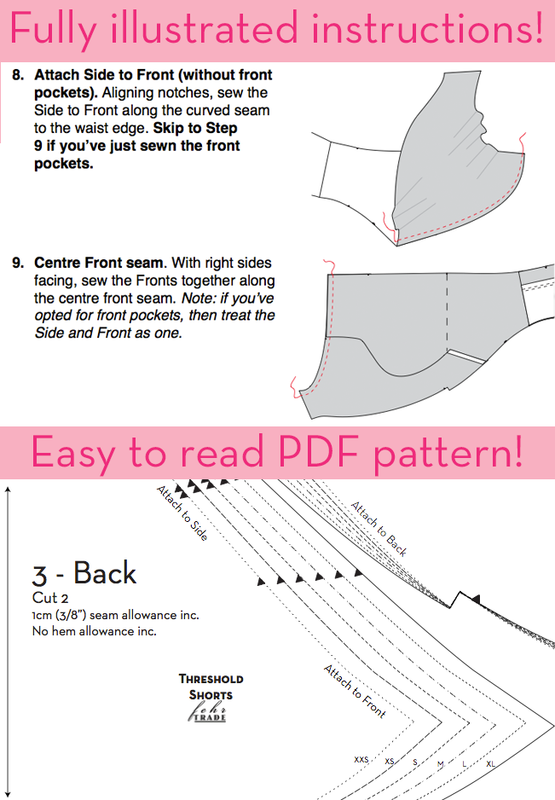 All my digital sewing patterns have been road-tested by myself and a team of fellow fit sewists. This pattern in particular has been in development for over four months, and I will be running Berlin marathon in a pair! Separator image Posted in Gallery and tagged with fehr-trade-patterns, threshold-shorts. 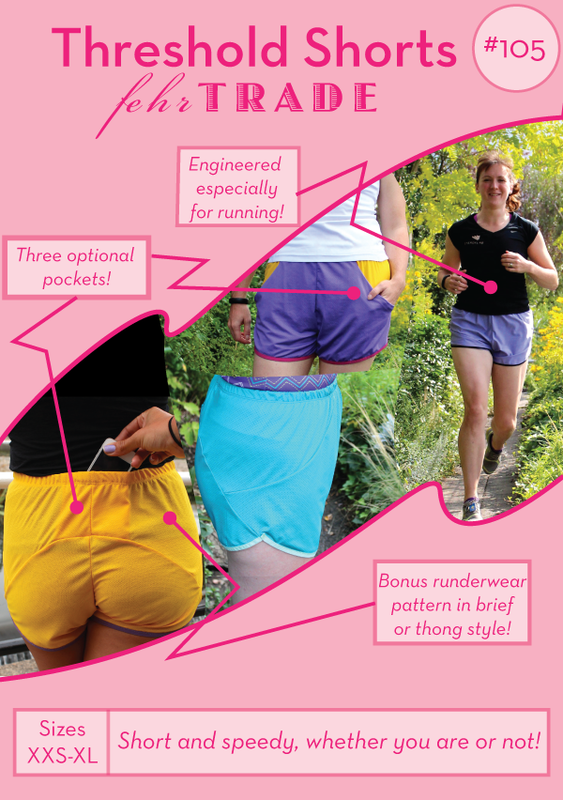 On sale now: Threshold Shorts pattern with bonus runderwear!